This past weekend, my friend Meghan and I took a quick trip to Amsterdam. We left Thursday night after work and got home Monday evening, so we truly just popped in for a long weekend. Amsterdam and the Netherlands had been on our list of places we wanted to visit for a long time now, and when Icelandair had one of their silly cheap sales, we couldn't pass up the opportunity. 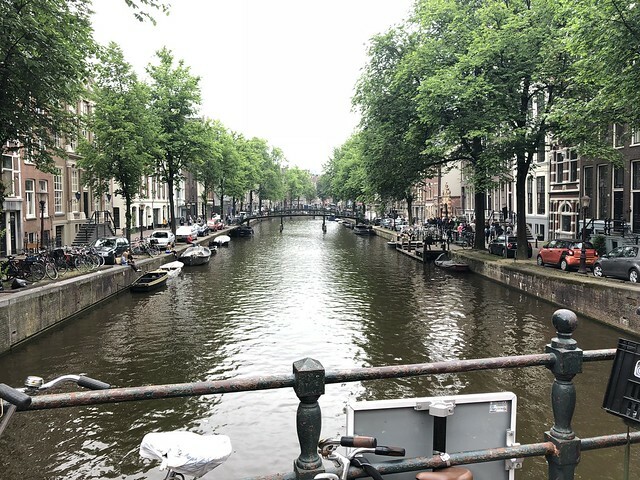 With our $380 plane tickets in hand, we jetted across the pond to eat delicious food and explore the gorgeous city of Amsterdam. We landed later on Friday than planned after experiencing a few delays because of the weather, but we really easily made our way from the airport to our hotel and then set off for an evening walk around the city. Pretty much right away we were captivated by all the beautiful canals. We also learned pretty quickly that we had to double and triple check for bicycles before crossing the street. It was kind of cool to see so many people getting around by bike. But also slightly terrifying as a pedestrian because bikers seemed to come out of nowhere. 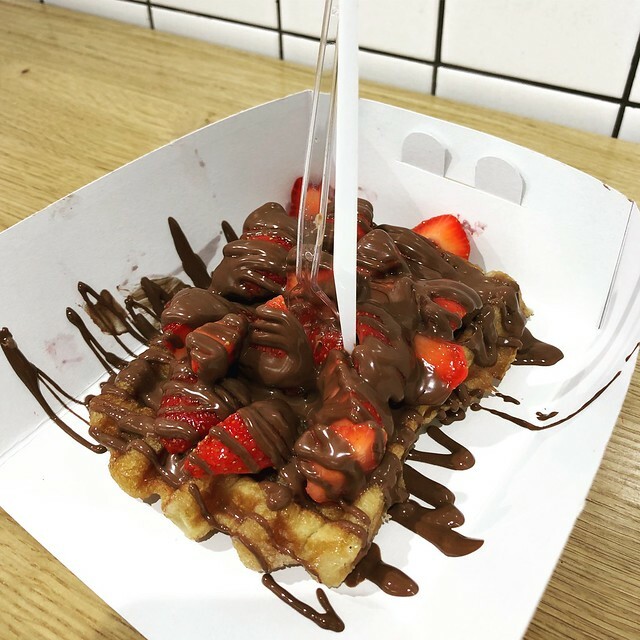 Our first meal in the city was a giant waffle smothered in Nutella and strawberries. It was amazing. The highlight of our Friday evening was probably exploring the floating flower market. Tulips are my favorite flowers, and the ones at the market were gorgeous. I really wanted to bring some bulbs home. Some vendors sell bulbs you can safely bring through U.S. Customs, but unfortunately when we were there, there were none available. 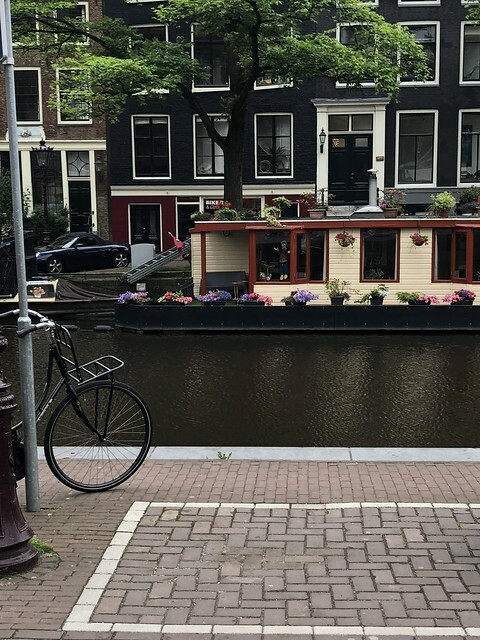 We started off our Saturday morning wandering through the quaint Jordaan neighbor on our way to the Anne Frank house. 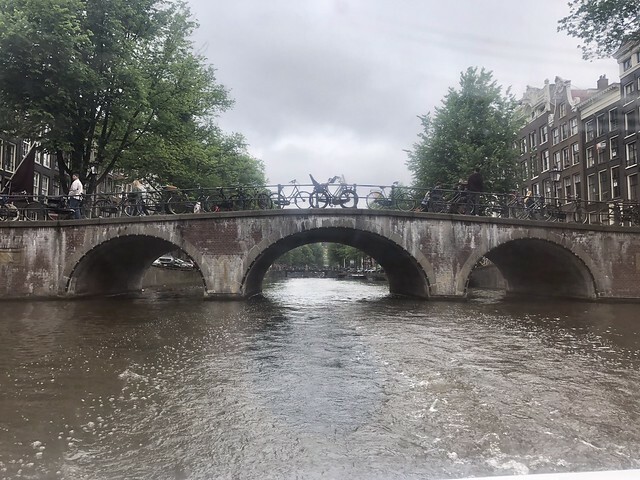 We passed lots of house boats and of course enjoyed more of the views from the bridges over the canals. 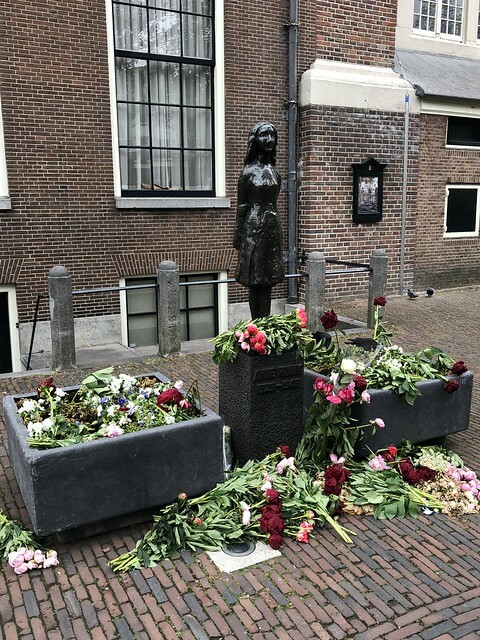 The Anne Frank House was a really moving museum. To see the place in real life that I remember reading about as a child was interesting. As a kid, I think I pictured the rooms where the Frank family stayed to be much smaller than that actually were. That's not to say that the rooms were actually big in real life, but they were bigger than what my little-kid self imagined. We also indulged in a fun canal boat cruise on Saturday to see the city from the waterways. 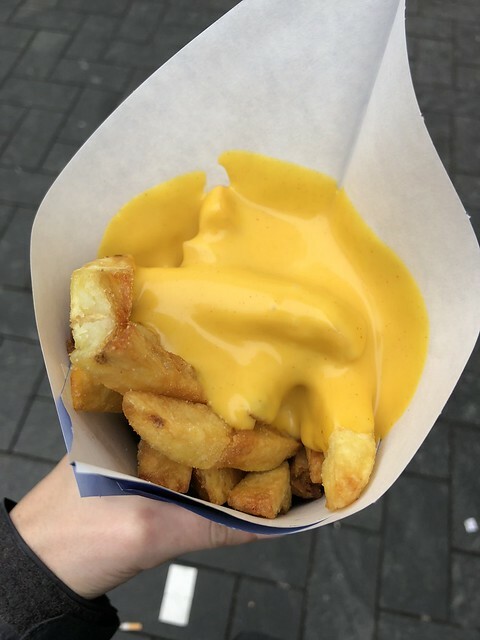 We followed up our busy morning with a delicious lunch of Amsterdam's famous fries. As you can see, I ate extremely healthy food on this trip. That afternoon we spent more time walking around the city eventually making our way to the Red Light District. It was a trip (not because I took drugs). 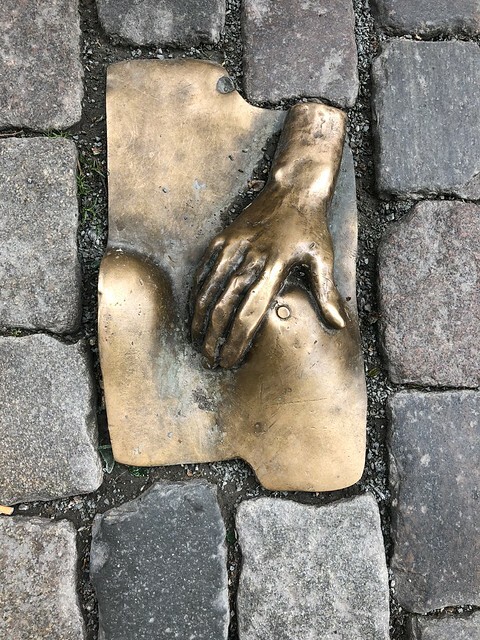 Taking pictures of any of the workers is a big no, no, so I will leave you with this picture of a sculpture we saw on the ground. It's definitely exactly what you think it is. The other cool thing we stopped to do in the Red Light District is visit the museum of Our Lord in the Attic Church. 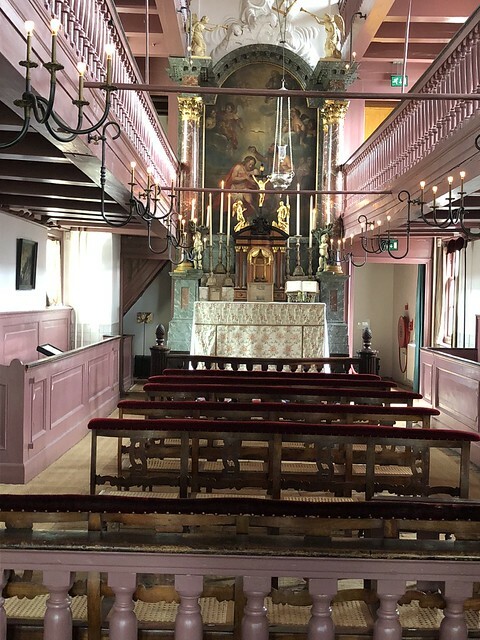 Back in the day, Catholicism wasn't really allowed to be practiced openly in the Netherlands, so people used to build secret churches in the back of their houses. This was a pretty cool tour through one such house church. One minute you're just walking through a kitchen and then next thing you know, you go up a set of steps and boom you're in a pretty sizeable church that no one could see from the outside. 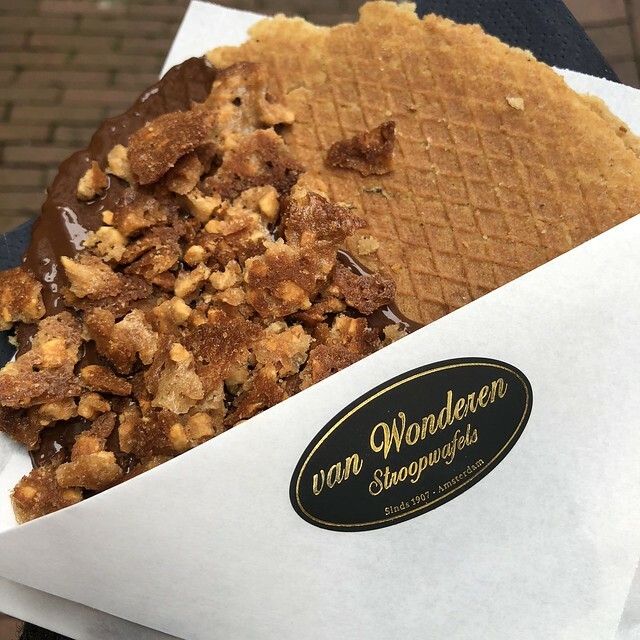 After exploring the holy and the unholy in the Red Light District, we decided it was time for more of Amsterdam's tasty treats. 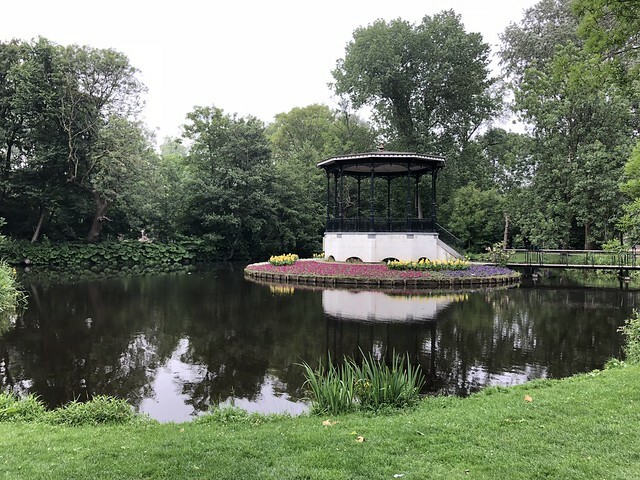 We wrapped up our first full day in Amsterdam with a stroll through Vondelpark. It's basically Amsterdam's version of Central Park. 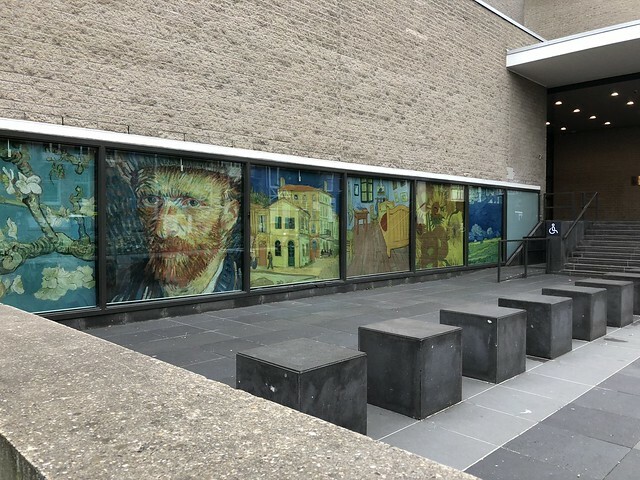 Then we walked a few blocks to the Van Gogh museum. They happened to have a special exhibit on Van Gogh's Japanese inspiration, and since I was just in Japan, I found it pretty cool. After dinner at the Heinken pub, we collapsed into bed. That looks amazing! My company has an office in Amsterdam with people that I have to interact with daily, so I'm really hoping they will send me over sometime. I've always wanted to see the city. Totally jealous!